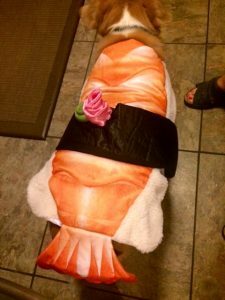 Soldier’s sushi pet Halloween costume fits snugly around his waist without any trailing pieces or elements that could obstruct his vision. s. They dress up their dogs and cats in everything from a simple ghost costume to elaborately coiffed pirate get-ups, long gowns, zombie clothes or UPS uniforms. It’s all in good fun, but there are lots of pet Halloween costumes out there that don’t measure up to the safety standards you should have in order to make sure your pet is injured in any way on Halloween night. If possible, buy made in America, as these will generally be sturdier and flame retardant. There will be lots of jack-o-lanterns with candles and wagging tails or loose pieces of costume can ignite in an instant. Check the fit of the costume to make sure it doesn’t drag on the ground. You don’t want your dog or cat to trip and fall or trip up a trick-or-treater. Make sure there aren’t any loose strings or elastic that could choke your pet. 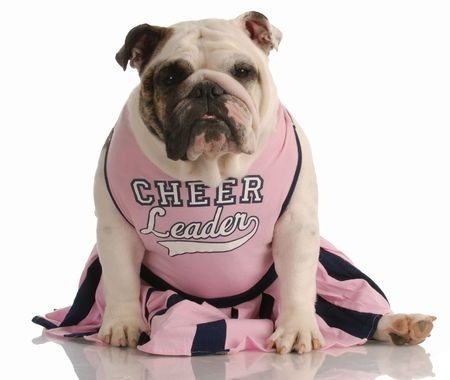 Try to avoid costumes that have hats or hoods that could slip down and obstruct your pet’s view. If the costume does include a hat, make sure it is safely secured on your dog or cat’s head so that it won’t shift or move around. If your pet Halloween costume doesn’t have reflective strips, add some reflective tape along the sides to make sure he can be seen easily in the dark. Don’t put a costume on your pet for the first time on Halloween night. Wearing a strange costume could make your dog nervous; expecting him to wear it for the first time on Halloween will only increase his unease. Put it on him for a few minutes the first time, then increase it to a half-hour or so. Let him walk around the house in it and get used to it. On Halloween, he’ll be much more comfortable. Make sure children know that they mustn’t tug or pull on your pet’s costume. If your pet simply doesn’t seem comfortable in his pet Halloween costume, don’t force him or her to wear it. Opt for a simple Halloween themed collar or bandana. Finally, make sure your pet is comfortable if he goes trick-or-treating with your family and keep him on a leash at all times. Halloween night can be frightening for your pet and you don’t want him to get lost or injured. Mr. N does have some costumes with hoods and hats but he just wears those for photos. He likes wearing clothes so costumes don’t bother him.